Coming Together anthologies published by Phaze are edited by Alessia Brio. Each collection of erotica benefits a different charity. Visit the official Coming Together website for more information. 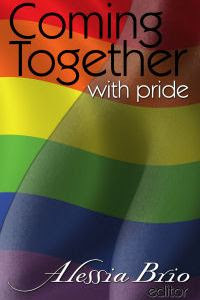 "Coming Together With Pride" benefits AIDS/HIV research. Reviewing a book published with such good will and to benefit such a good cause is difficult, because the bottom line is that YES, YOU ABSOLUTELY NEED TO BUY THIS BOOK. That said, and since you are dutifully going to buy the book to support the cause, let me say that, like any anthology, this volume has strong stories and weak stories, stories I loved and stories that didn't appeal to me personally. It is more varied than most because it has het, bi, m/m, f/f, older characters, very young characters, vampires, werewolves ... I can't think it would be possible for anyone to love every story, even though we can appreciate the spirit of giving that each author has exhibited in contributing to this book. So let me simply say that the awesome introduction by Will Belegon is possibly the very best thing in the book. That essay alone makes the book worth buying, even if it were not a purchase for a good cause.